None of these growth apps focus on LinkedIn—which is strange because that’s where all of the people with jobs and money are! Currently, if you want to expand or engage with your LinkedIn network, you have to spend hours on hours doing it manually. This is where our friend Leonard and its genius automation saves the day—and your precious time. Growing your network on LinkedIn used to mean combing through connections and sending countless invitations. But with Leonard, you can now automatically send hundreds of personalized invitation requests in minutes. Choose who you send an invitation to with filters such as keyword, industry, company size, location, and relationship (2nd connection, 3rd connection, group, etc.). It’s not enough to just add people to your network; you have to engage with them. Send bulk personalized messages to your first connections. Messages can be customized on the spot or pulled from a template. Automatically view people’s profiles. LinkedIn is the only social media that notifies you if someone views your profile (thank goodness), and with this feature, Leonard keeps your pretty mug in everyone’s notifications. Even though Leonard is a bot, its advanced AI allows for it to learn your LinkedIn behaviors so that it can perform tasks exactly like you would. See. It even takes coffee breaks like you!Right now, Leonard users are connecting and expanding their network with as much effort as I put into stopping Netflix from automatically starting the next episode (very little). And the plan most users seem to be gravitating to is the Business Plan. People are paying $99 a year for this plan to have Leonard be their LinkedIn Siri. But, Sumo-lings, you have the chance to get lifetime access for just $49! Want a plan with a little extra? Stack two codes and get lifetime access to the Leonard for LinkedIn Enterprise Plan. Now, just because Lenny is covering you at work doesn’t mean you play hookie. Best practices include manual work like having safe settings to avoid upsetting the LinkedIn POS, posting valuable content, and personal interaction. Free or paid, you won’t find another tool in the market that is as easy to use or has as many automation features for LinkedIn. 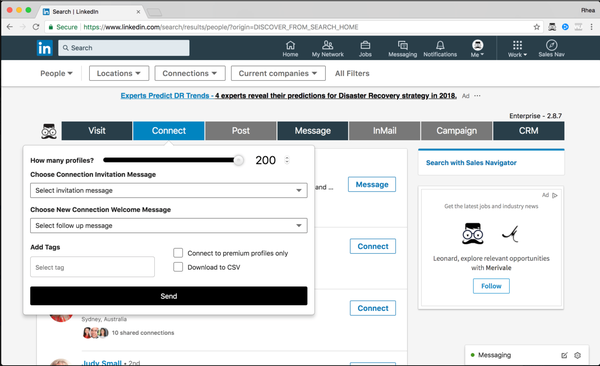 Most of the action will take place inside of Leonard for LinkedIn’s CRM dashboard—this is where you manage how you connect with your network. 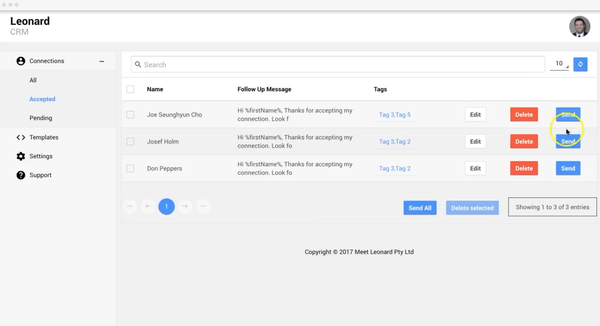 In the CRM dashboard, you can manage invitation requests, create message templates for connection invitations, follow up messages, and general messages, and add tags. Being well-connected on LinkedIn is important, but it shouldn’t cost you all of your free time. 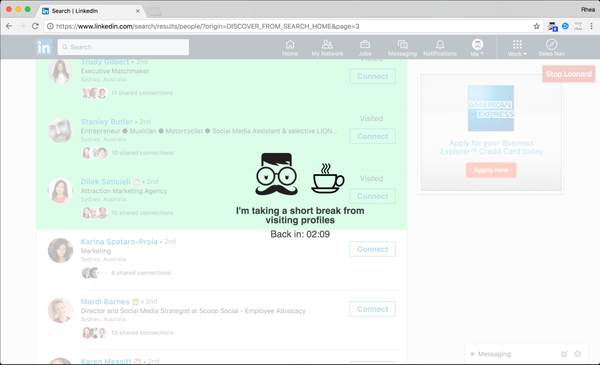 Leonard for LinkedIn saves you time with automation, all while helping you capitalize on your connections. Sumo-lings, it’s not a secret that certain aggressive practices can flag your account – so use the recommended settings to have a more natural growth.Leonard spaces out its actions throughout the day to simulate regular human activity. Strengthen your professional network for just $49! P.S.Stacking two codes will unlock lifetime access to the Enterprise plan.